What makes a good outfit for you? Its a funny old question, perhaps one that’s answer changes regularly. But I’ve been thinking a lot about this lately. What makes a good outfit for me? What is ‘stylish’? Well for me of late I have been enjoying very very simple outfits, but with some key pieces and adding in lots of happiness. Maybe that’s the formula for a good outfit? Take this simple blouse and jeans outfit. I debated on whether to post this every-day, run-of-the-mill outfit in fear that it may be a little, um, boring? 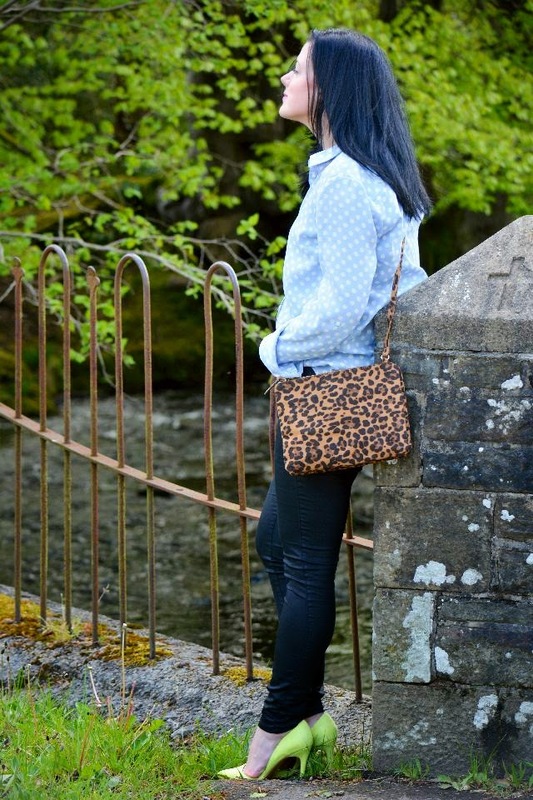 I mean you’ve all seen many a blogger wearing jeans and a blouse before, right? So why post it. Well i guess because to me this is a happy little outfit and that is what i like to wear and share. Plus clothes are just that…clothes. Unless i started wearing trousers on my head and calling it a trend we will all have seen the same outfits over the years, no? So what makes a good outfit? Something that makes you happy i reckon. What d’you think? This spotty blouse has been my constant compadre the past week or so.Its been worn to do pretty much everything and anything. Coffee with the besties, yep! Meetings and school run’s, yep again. I just love how easy it is to throw on and feel good. A piece of statement jewellery; In this case my neon NewLook necklace has been on more times than its been off these past couple of months. The perfect blouse; with a popped collar and a little front tuck, I think sometimes it’s not what you wear but how you wear it? Fit-like-a-glove-Jeans: When I find a pair of jeans that fit to perfection, they really make me feel a million bucks, or pounds rather, either way. When the fit is right everything just looks better. So there we have it. Simple things for me that make me happy and are my (current) definition of a good outfit. So tell me what’s yours? What makes a good outfit to you? A stylish outfit for me is one that shows a bit of your personality and yours certainly does that – it's not boring at all you've made it individual with your accessories. And I think that's the answer for me – I just love accessories they are what make an outfit individual. That is a Good Outfit indeed. Your blouse, shoes, bag and necklace are stunning. I love Skinny Jeans with a Pretty Blouse. Also a Dress that I feel pretty in, makes a good outfit for me (like I am wearing today). Happy Hump Day, Rachel!! <3 Ada. A good outfit is one that makes me feel good maybe? And that feels like "me". I don't know, I've worn some fabulous things that have made me feel rubbish (shoes that pinch, boning that digs in etc.). So comfort has to be in there too! Feel the same way really. I think you can lift your outfit from the every day to special by adding some statement jewellery or shoes, or a bag. It doesn't have to be something big. Even just painting your nails! 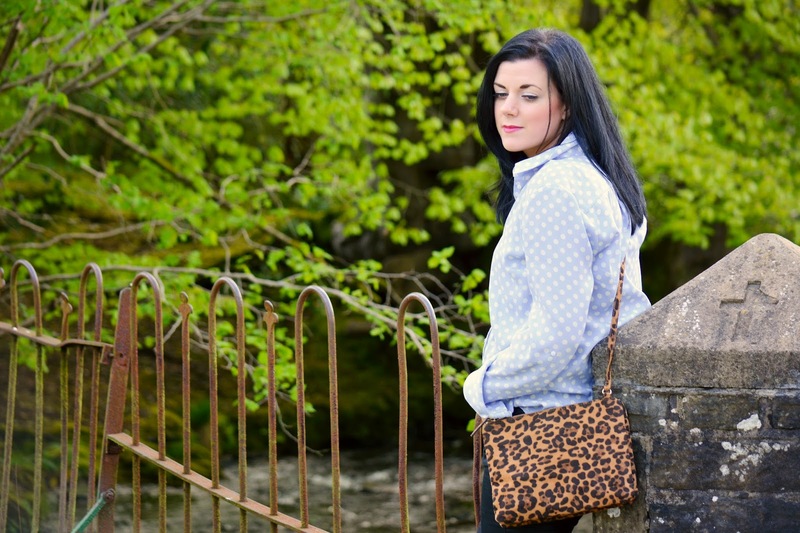 I am all about jeans, a cute sweater and accessories that pop to liven the outfit. I completely agree with your sentiments about clothes being clothes! I think it's a bit silly when outfits are referred to as 'groundbreaking'. By the way I love this outfit and the pops of colour with your neon pumps and necklace! A good outfit is one that makes you feel good no matter what it is. I love how you styled this everyday look with the pop of color in the heels and statement necklace! 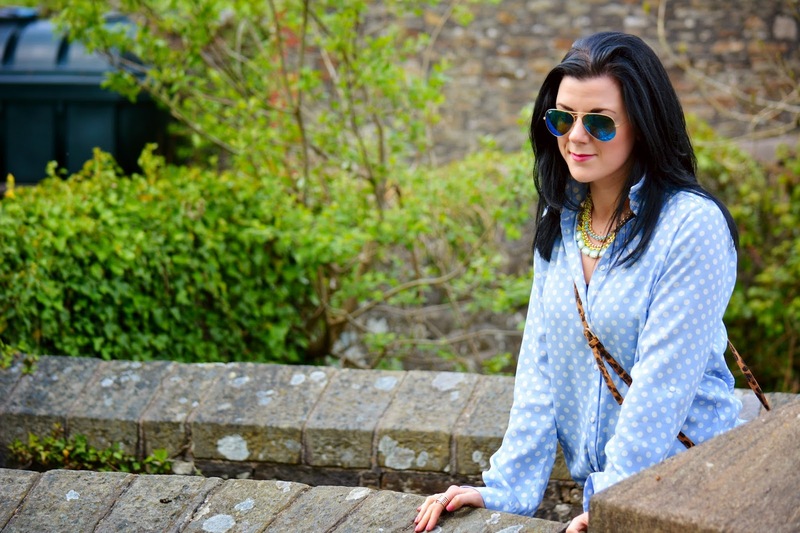 Hi Rachael, I love the blue polka dot top! So pretty on you, the jeans and then the yellow shoes are awesome. I love the cream yellow. Hi Rachel, if in doubt keep it simple is my motto. Hope you don't mind I have mentioned you and added a link on my blog, I've written a post on the RI Bardot top, but alas I do not look nearly as glamorous as you. Those jeans look AMAZING on you! I've been kind of leaning towards simplicity in my style lately too. 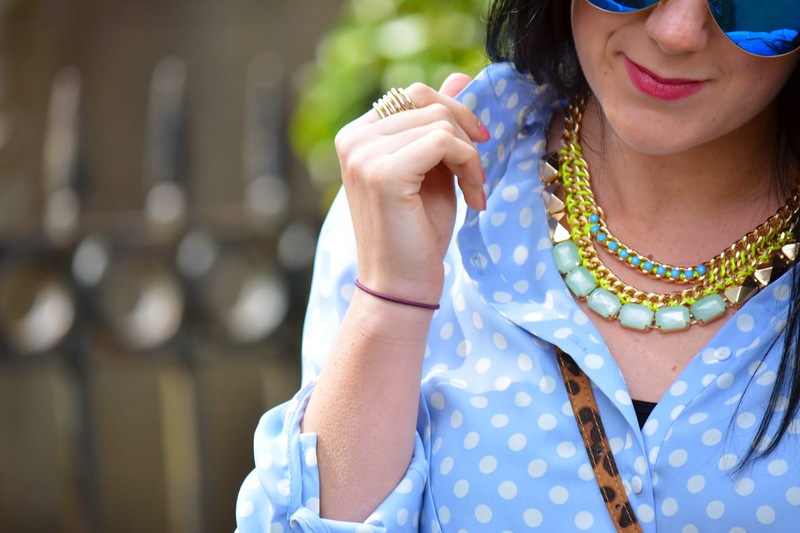 Love this look, the pop of color in the shoes and the layered necklaces really make it! I love the mixed patterns and colors. Very fun! So glad you shared this! 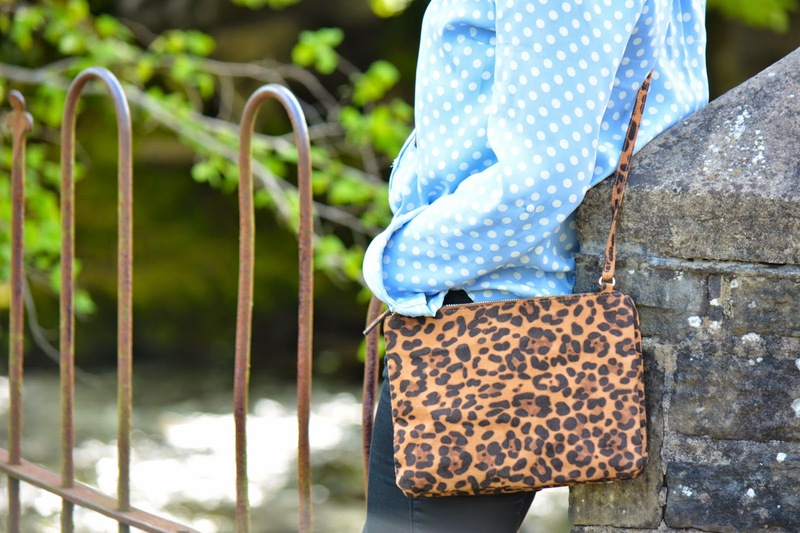 I love the polka dot with the leopard. Jeans and a blouse is also one of my go to outfits. The great thing about it is that you can style it so many ways. I also love a good dress. A good outfit and a stylish outfit aren't always necessarily the same thing, for me. I think a good outfit is one I actually feel good in – which is more and more rare every day lately 🙁 – and one which I've liked all day, not just when I was first putting it together int he morning as sometimes I find I've gone off it by lunchtime. Although I love shopping and seeing what is in the shops each season, I don't find myself buying into a style just because it was "on trend" (incidentally I hate that phrase) and will just buy the things I like and team them with the things I like. I take my inspiration from all number of places – blogs, magazines, websites etc.